Most encumbered property has been sold leaving the heart of the melon available for your city approved intended use. Highly visible with high traffic count making it very desirable if exposure is a must. With all medical related neighboring businesses along with hospital & most other services, an ideal location for all phases of senior living. See attachment explaining C-3 zoning. By all means compare value at $5.00 per foot. 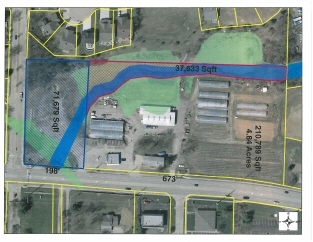 Apprx 2.5 acres have been sold off of the 7.49 acres shown in tax records leaving the prime remaining 5 acres. Sale has been so recent that a new tax ID number has not been assigned to the remaining 5 acres being offered for sale. See listing agent for more clarification if desired.